NARRATIVE: At just after 1pm on Thursday July 11, 2008 the Spokane Fire Department was dispatched on a fire in the alley behind a commercial building. Upon arrival it was found that there was and area about 200 square feet burning and extending into a commercial building with a heavy fire load of wood products. A quick attack was attempted but the fire had spread into the structure and a 2nd alarm was requested followed shortly by a 3rd alarm. All together 66 Firefighters, 11 command staff, and several support agencies responded in 31 fire vehicles. The fire is under investigation and nobody was injured. Damage to the Ugly Duck liquidators was significant but most of the business sustained little or no damage. 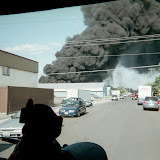 This fire which stretched the city's resources occurred during a red flag warning for high winds and low humidity which assisted in a number of large fire events at the same time.